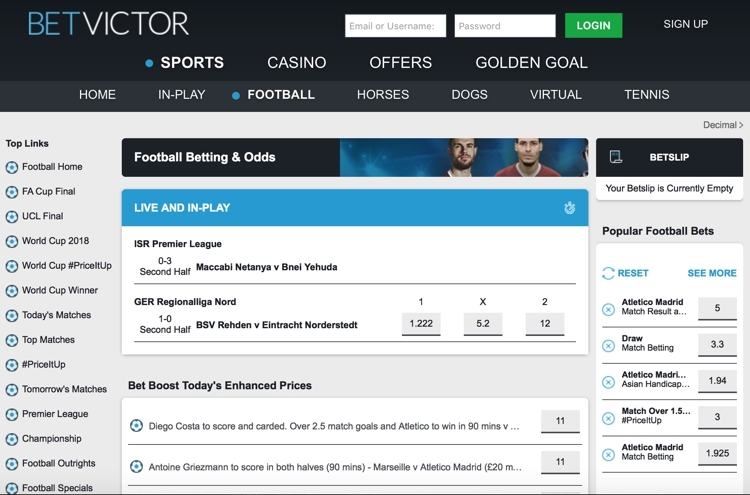 It’s tough to really think of many bookmakers that have been able to adapt from their high street presence to that online better than BetVictor. Whilst rivals are all big in their own right, the company have been one of many who have ditched the high street in favour to pursue their online market; a gamble that has massively paid off. What’s been great to see from BetVictor is the company’s constant innovation. Whist this article is related to football betting, probably their strongest area, it should also be noted just how good an all-round option they have become for many bettors across dozens of sports. Pricing has always been a strong point at BetVictor. In fact, they’ve been so good that they been able to pick up numerous awards over the years for consistently being best priced on football betting markets. The good news that you’re about to hear is that their strategy and philosophy has carried on today and with it see’s them as one of the best bookmakers in the industry for football betting odds. The sheer volume of professional bettors, along with recreational bettors, speaks volumes in our opinion! As we do with all bookies, we like to compare them back to back to see how they are performing at any given time. A lot can change at bookmakers and fast, so it’s important that your data is as up to date as possible. We decided to check out some of the upcoming Premier League matches as part of our testing to see where they stood. It was really pleasing to see that even from 2 of the first 4 games that we looked at, BetVictor we already right there in the mix with the pricing. The game below is an upcoming match between Bournemouth and Manchester United and highlights they are not only best priced on the draw, but also that of a Bournemouth win. In fact, if you look closely at the Manchester United price, it’s not all that far best price in that as well. Our quest for the clean sweep continues! To be honest, in the Premier League, we could list dozens of markets that follow the same suit. Our findings were backing up the hype that we had heard previously about their attention to detail when it comes to their pricing structure. Saying that they were consistent probably would be an understatement, but we were quick to realise just why so many people used this bookmaker for betting on the Premier League. There is more to football betting than the Premier League though, so we decided to next move down the leagues, looking at the likes of the Championship, League 1 and League 2. Test with other bookmakers showed that these odds seemed to be much more varied. There are many more games than the Premier League though, so this is to be understandable. What we did find, that we probably weren’t expecting to find is that BetVictor offered up really good odds on the draw. In fact, from a single Championship game week, we found them to be best priced on the draw in 4 of the 12 games for that week. This is actually a really interesting find and if you are looking to bet on the draw, we feel like BetVictor could be a great shout. We do realise that this likely isn’t going to be where most people are betting, so it is worth noting that for other results they are highly consistent. You can see from images above that they are never far behind the best price for another of the games on any bets. We also spent some time looking at other markets such as BTTS and Over/Under goals markets, with results highlighting a similar theme. The consistent nature of their pricing structure is definitely something that people need to latch onto. If you are the type of punter that likes to just use one site for all your bets, we think you could do a lot worse than using BetVictor. In terms of market coverage, the games offer a good mix throughout the leagues to be honest. Premier League matches are looking at around 84 or so markets in total, and as you move into the Championship, League 1 and League 2, these numbers do drop ever so slightly, but still hover around the 75 mark, which is great for these lower league games. Whilst 84 markets might not seem an awful lot, it’s actually turned out to be a nice amount. Yes, some bookies are offering over 200 markets for their games, but to be honest, who is ever going to utilise all of those? Spain, Italy and Germany dominate the international coverage that’s on site. But, the one thing that did notice is that whilst the like so La Liga, Serie A and Bundesliga are all on offer, there is a distinct lack of lower league Spanish football. Both German and Italian coverage is excellent, going down to the third their in Italy and the 6thtier in Germany. In fact, fans of German football probably won’t find a better, more in-depth range of games than at BetVictor within any UK bookmaker! As you start moving into the more niche leagues and markets, BetVictor can hold their own with the best. If you are into your Argentinian B league games or may be more the Egyptian Premier League, then you’re in luck, as they are both covered with around 60 other countries in total. Price It Up is the latest campaign that’s being run by BetVictor which allows the punters to create their own bets. The process is pretty simple in that all you need to do is Tweet BetVictor using the hashtag #priceitup and then include the bet you want to form. The image below gives you an idea of the type of bets you can bring together. The Price It Up campaign is a great way to build bets from the same game. It’s worth nothing that you can bet on other people’s bets if you want. The example above is a bet that some has obviously tweeted and then it’s been posted on the BetVictor website. The only downside to BetVictor’s version is that it doesn’t include a cross-game option. Meaning that all your selections need to come from a single match. It’s actually one of the few bookmakers to not offer this function, so it’s been slightly disappointing to see. BetVictor have jumped on the increase in free football betting games with their take of Golden Goal. The game is open to any punter that’s placed a bet in the sportsbook and it then gives them a chance of winning up to £25,000. All they need to do is predict the first goalscorer, the minute that they score and the correct score to land the jackpot. As it’s free to enter, technically, it’s one of the better markets to take advantage off. Even if you place a small bet, you will still qualify for an entry. The transfer specials board is a hive of activity within the BetVictor set up and it’s pretty much as you see it. You get to choose from a host of transfer rumours and potential transfers and then choose which club that player will sign for before a certain date. It’s worth noting that is the player doesn’t sign then bets will usually be void unless ‘no transfer’ is an option within the market. Whilst this is seen as a bit of a novelty market, there can be some strategy applied. You need to be someone in the know though and often social media is a great place to start. However, be warned that if BetVictor get even a whiff of a potential move or a significant amount of money, they will suspend betting on the market, so you really need to get in quick. The match action market is something that we haven’t actually come across though. For most of the major games, especially within the Premier League, this section allows you to select the number of goals, number of corners and the number of yellow cards in a game before spitting you out a price. It’s similar in format to the Price It Up feature above, but it is worth mentioning that eth bets are lines. So, you will choose something like over 2 goals, less than 3 yellow cards, over 5 corners or along those lines at least. The cash out function at BetVictor is available and it’s one of the better interface that we have tested. The function includes the partial cash out feature as well, which means that you can cash out just some of your bet if you wish. It’s also worth noting that if you are unsure, you will see a little logo next to any game or market that can be cashed out. This is highlighted in the image just above in this section. 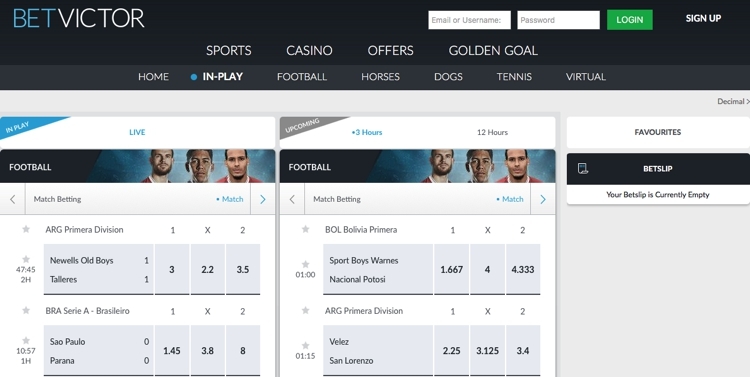 The in-play betting section at BetVictor really felt like the HUB of the site for the first time. The homepage doesn’t give much away and allows you to find where you need to be and quickly, which is totally fine with us. But, as you venture in-play the site seems to come alive and with it you are greeted with all games that are currently in play and all games that are about to turn in play. The layout is pretty simplistic, which follows suit of the rest of the bookmaker. Everything is kept minimalistic and we think this works best as you work through the games that you want to bet on. Taking advantage of the favourite button highlights the games, but it doesn’t move them tot the top of the screen or put them in a different section, which was a little disappointing to be honest. The section opens up again when you click on the game. It moves into a three-column layout, with other matches down the left, the match centre and betting markets through the middle and the betslip down the right. Again, it feels very clean and organised. Perfect for anyone with OCD! The graphics for the match centre are superb. It looks like a proper lower league football ground and whilst it doesn’t highlight positions on the pitch like some do, it does give a fairly decent overview of what’s going on. What we will say is that data is pretty thin on the ground as well, with just the score, corners and cards on offer. You’d have no idea as to how each team was playing really, which other match centres can offer you through variables such as possession and number of attacks. The match coverage is strong, with a good range of Asian lines to utilise. 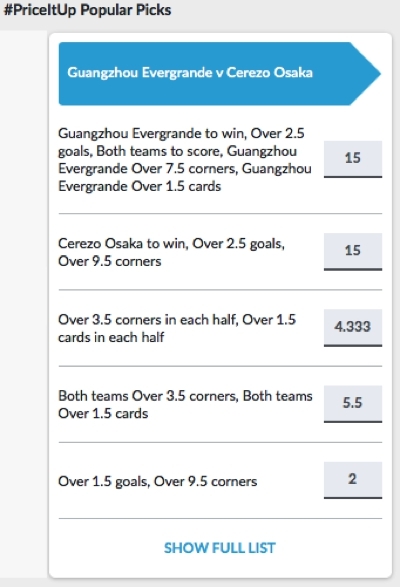 They also include Quick Bets, which means you can bet on the outcome of a match up to a certain period, say for example, up to 75 minutes. All Men’s full International matches including World Cup Finals and qualifiers & UEFA European Championship and qualifiers. The range of deposit methods on offer are fairly good. You have the likes of Visa, Mastercard along with Skrill, PayPal. Whilst the range of options are fine, the thing that we should mention is that BetVictor are one of the better bookies when trying to get hold of your money. We found withdrawal times to be with some of the best that we had tested, which was very pleasing. You’ve no fees to pay at any point and the minimum deposits start from just £5! It’s always great when you work through testing a bookmaker and you find something as well-oiled as BetVictor. They are a bookie that has a long and illustrious reputation, but that doesn’t always mean an awful in this industry, as we have tested and reported on. The site does very little wrong. In fact, when it comes down to it, finding it’s weak spot is very tough. If we had to criticise it, it would be the lack of market depth or the fact that it can does lack a boatload of features to choose from. But, these are all extras that in reality, we don’t really need. What we really need from our bookie is great odds and to get our money in or out both quickly and safely. BetVictor ticks all those boxes. The pricing is about as strong as you are going to find. We know our test probably wasn’t as comprehensive at it could have been testing every single match on their site, but they haven’t picked up industry awards for pricing for no reason at all. Whilst a lot of bookies are very good these days, we would say that BetVictor has to be within the top 3 in the world, easily, especially if you are betting on football. If you aren’t already, then you really need an account as it will work great for punters who like to use just the single account and also those looking to add it to their fleet.